My friend Don, back home in the High Country from a driving trip in Europe, told me he “hated” most of France and Spain. Why? Because, as was his usual pattern, he pre-booked all of his hotel accommodations in city and town centers, and found the traffic to be terrible and the cities to be packed. The only places he enjoyed were the small towns and countryside. This was a predictable outcome. He now recognizes that he would have been better off on a free-form trip, keeping to the countryside, and staying anywhere along the route he found attractive. 1. Select a region you’d like to explore. Choose on the basis of what interests you: scenery, food, buildings and monuments, historical sites, whatever. Make sure the area is large enough to provide a reasonable range of stops, but small enough that you don’t have to drive more than a few hours each day. 2. Before you go, get one or more guidebooks covering the area’s attractions and activities and another one or two covering accommodations and restaurants. In the U.S., that means some combination of a good destination guide and the AAA or Mobil guides. If you like B&B accommodations, get one or more B&B guides, or download and print online regional directories. In Europe, that means, at a minimum, the appropriate Michelin “Green” regional destination guide and the national Michelin “Red” hotel and restaurant guide. Research the region carefully—both the sights/activities and the general highway layout. You don’t need to map out a detailed itinerary; spontaneity is part of the fun of free-form touring. But you should have a feel for the region’s “must see” stops, regardless of the order in which you visit them. 3. Get the most detailed maps of the region you can find. In the U.S., that means the usual state highway maps, plus whatever AAA maps are available for areas within the region. In Europe, that means however many of the highly detailed minimum-area maps you can get from Michelin or its several competitors: They’re available at any good travel bookstore or online through Amazon. 4. Plan your trip for the low season. This is critical. Free-form touring just doesn’t work in a region’s high season, when you can expect most accommodations to be fully booked and restaurants mobbed. You don’t do free-form touring in New England during the fall foliage season, or the U.S. coasts in summer, or the Colorado Rockies during ski season, or Normandy or Tuscany in August. We’ve found some really nice overnights on the Oregon coast in late fall, in Tuscany in late fall, and in the French Alps in early summer. 5. If you’re renting a car, rent one in which you feel comfortable. Your car will be “home” for the duration. Skimping on rentals is a major mistake. 6. When you start touring, pack so you can keep most of your stuff in the car’s trunk and schlep only a toilet kit and one change of clothes each time you check into a hotel. 7. Avoid big cities and even sizable towns—free-form touring doesn’t work well there. Even if it did, most city and suburban accommodations are now chain motels. If you just have to go into a city or two, stay in the outskirts and use public transportation to get in and out of the center. 8. Stick to the side and back roads; forget freeways and main highways. 9. Stay overnight when and where you feel like it. In Europe, some of the least expensive countryside accommodations are “restaurants with rooms,” and you can get some great meals there, as well. 10. Take it easy and have fun. 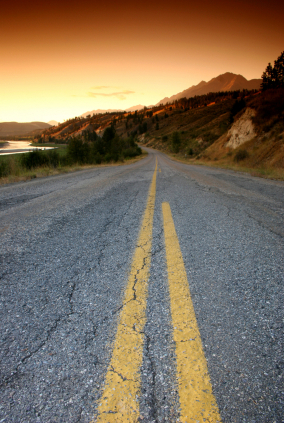 What are your best tips for hitting the open road? Share your advice by adding a comment below!